“Bring me a book to shred,” Movana said. “Which book should I pick?” I asked myself. That book of special meaning to me would be destroyed forever. In her 10 years’ creative practice, Movana Chen has destroyed the content of books or magazines and transformed them into wearable art, performance, sculpture and installation. I came to know Movana and her “Knitting Conversations” earlier this year. By participating in the project, I decide to make a transformation too. In my journey of self-discovery (so far), there are some parts of me which seek for improvement. What is that significant piece of literature that represents my dark side? Once then I was planning to take up a pastime after work, and I was fond of the exotic Espanol. At the same time, a friend just met shared her passion in language too, but hers falls on Deutsch. It wasn’t too surprising that the indecisive me was convinced to follow, taking a German language course I’d never thought of. When one was younger, such unexpected outcome was welcomed. “Life is unpredictable,” I told myself then. This textbook represented indecisiveness and blind-following which I had difficulty to embrace. The most hilarious of all was that the textbook and the course CDs were kept 8 years after many rounds of moving as if I would learn German again one day. How pitiful was I! I recognised this past and my dark side; the process of shredding and knitting made me coming through denial. There are many more stories like mine as “Knitting Conversations” has involved 150 participants around the world in the past 2 years. This is a collaborative work that the artist has invited family members, acquaintances, new friends, students and even strangers to give her a book of special meaning or memory from their bookshelves. 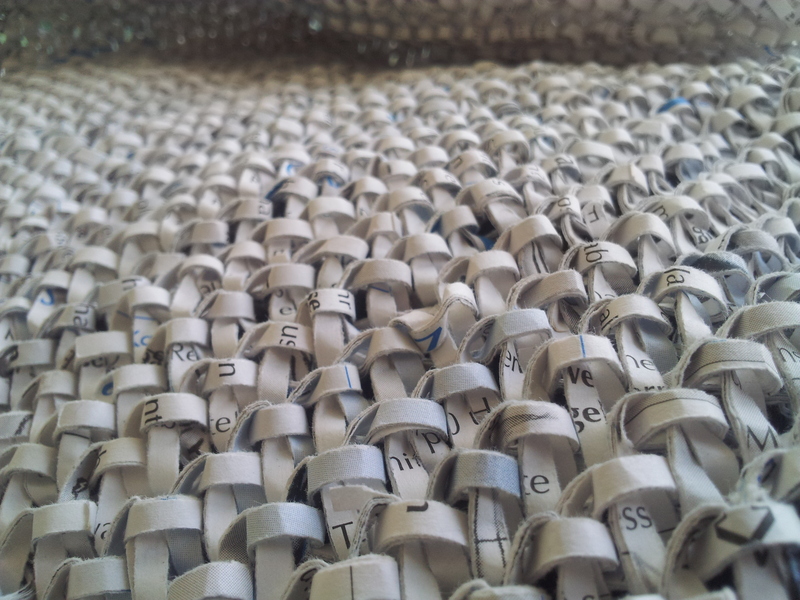 When the book is shredded and knitted, the text would hardly be recognised. Since a knitter concentrates on mechanical and repetitive movement, one may put aside the original private attachment but reenact a bonding to the piece being knitted for weeks, months or even years. “Knitting Conversations” acts like a space where transformation of attachment takes place – from a book to a self-knitted piece. Therefore, some participants find this process meditative while some are sad to part their substantive soulmates. One by one when Movana collected the finished, half-finished or unfinished pieces from the participants, she sewed them together and eventually presented a 15-meter-long installation debut in her solo exhibition “KNITerature”. In the opening night of the exhibition, over 50 knitters gathered under their collaborative work and did a knitting performance. Many of them met for the first time but because of their engagement in the project they were connected together, echoing the formation of the patchwork. Some knitters were so eager to share among themselves in their common language while some were pleased to teach other guests to knit the Movana way. A knitter community is organically formed, by extending one’s engagement from a private sphere to a public sphere. Paper shred is stronger and more than expected. Knitting is a traditional craftsmanship that connects a mother with a child or a girl with a boy as a representation of affection and love. 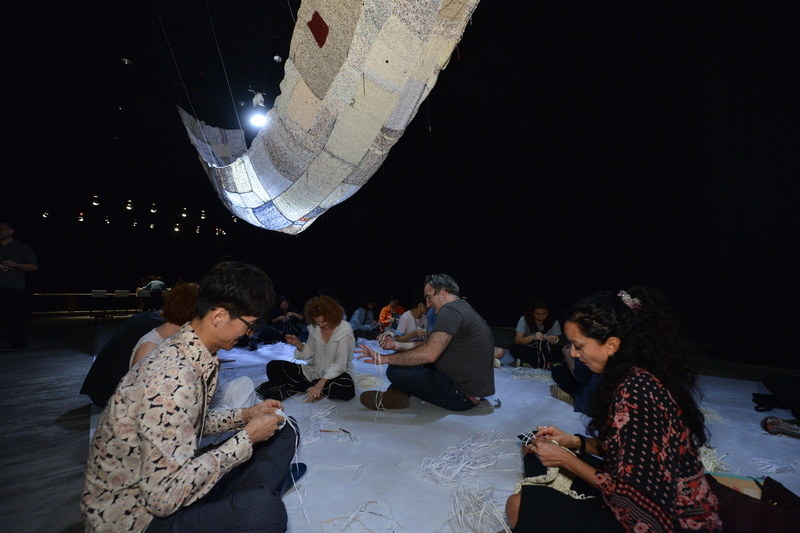 “Knitting Conversations” is an artwork of connection in multi-facets; the conversations happened between the artist and the public, a participant and his/her literature of special meaning as well as the knitter community. 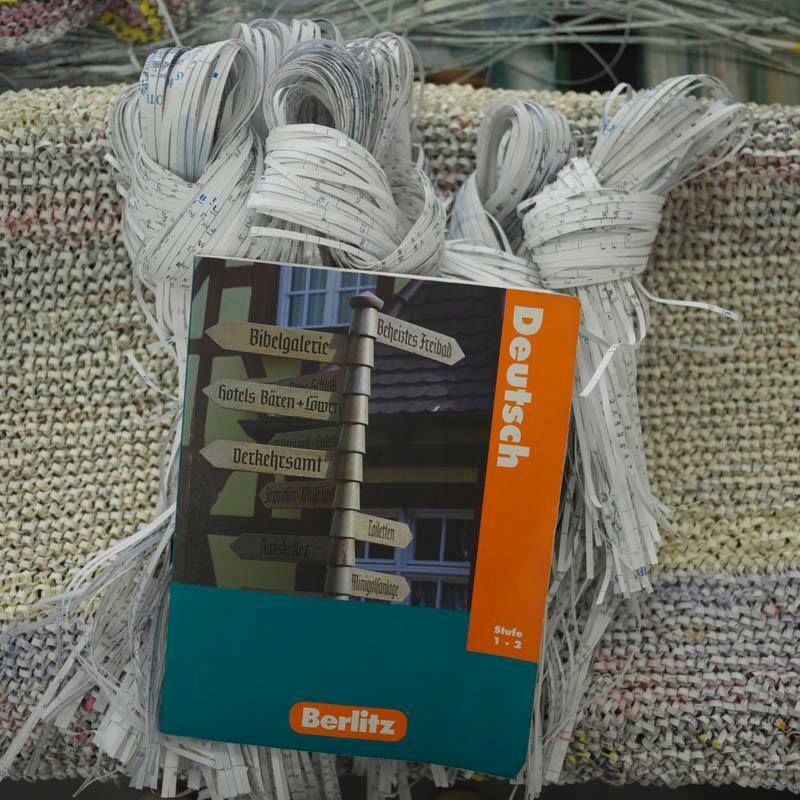 As a knitter, I believe its meaning is more than “Wow, it must take you long time to knit.” This kind of connection may not be fully understood by visitors appreciating merely the work on display, even with the presence of the journal and captions. There should be an alternate way to present this work next time when a curator understands the multi-faceted meanings other than the visual aesthetics. The article was also posted at The House News. ← Gai fong, where is the gallery?